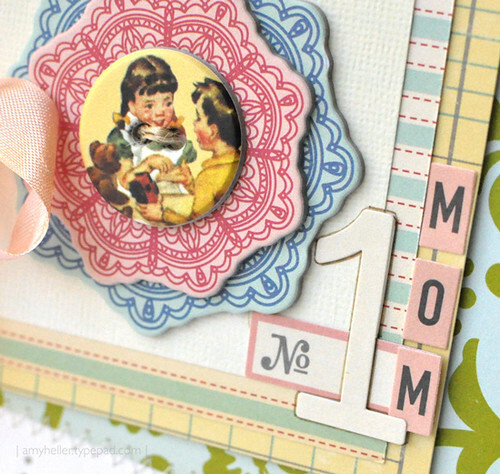 It's Jing-Jing here again today for my last visit as the April OA Guest Designer! I adore the storybook looks of October Afternoon's vintage images. Here in this layout, I cut out a few images from the back side of the Bubblegum paper to create a farm like scene for my layout. I was pleasantly surprised how just bits of reds in the 5 & Dime collection work so well with my fall apple pictures! Again, October Afternoon delivers a versatile collection that can work for all kinds of photos and projects. 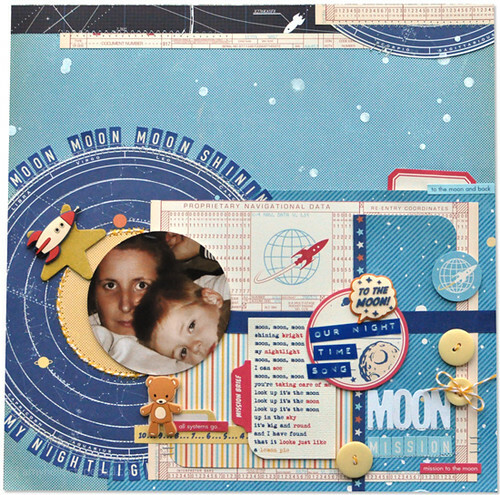 Thank-you so much Jing-Jing for sharing all your fabulous projects with us this month. It has been so great getting to know you and admiring your work! Have a great weekend everybody! Hi OA Fans! It's Amy here today with our weekly Sketch Challenge! 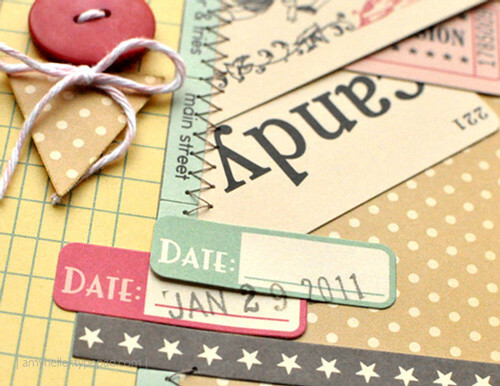 I'm a lover of all things whimsical, cute, bright, happy and fun when it comes to my scrapping and card making. But sometimes I find myself stuck in an "L-shaped" rut with my layout designs every once in a while. Don't get me wrong, the L-shape is a fantastic triangular design - I just find that I gravitate back to that shape whenever I start scrapping too organically. So today, I thought for my sketch I'd incoroporate a large element that I don't often create in my scrapping - a large circle. or more subtley. I decided to go literal with my circle this time, because a day or so after I created this sketch I was fortunate to get a lovely box of goodies from the upcoming release of Rocket Age! I simply could not ignore the draw I had to the 8x8" version of "Return Voyage" in my box. Perhaps you can say it was "Cosmic" or "It was written in the stars" that I use that paper with my previously created sketch! Ha, ha! Whichever the case may be, that's the route I took. However, I can easily imagine the more subtle uses of this circle : perhaps masking one with mists, or using a large chipboard "O", maybe creating waves or simply a path of gems. The possibilities are really endless! I re-emphasized the circle both with my photo and with my "moon" of patterned paper behind my photo. I even tried to harness my inner Kinsey Wilson with some handstitching around the perimeter of the moon. But let's just say, I'll leave that handiwork to the master herself - I ended up machine stitching over the top of my handstitching. With that addition I ultimately really liked the result - so who knows maybe that is a new technique for me!? As for the rest of my layout, it should be noted that I have never been one to follow a sketch to the "T". There's a rebellious part of my artistic side that says I want to take that sketch and put my own spin on it - so that's what I did - even with my OWN sketch! LOL! I moved the journaling down, since I wanted the adorable rocket image in my pattered paper to remain visible, and instead of using photos on the right side of my layout, I used the circle as my visual centerpiece and simply divided up the original photo placements with ribbon. Lastly, I moved my two "stars" from the bottom of the layout over to the right side of my layout bringing more attention to the title of my layout, which was only moved slightly from the sketch. How's about we take a look at another version on the sketch? Wilna created a beautiful layout of her daughter. 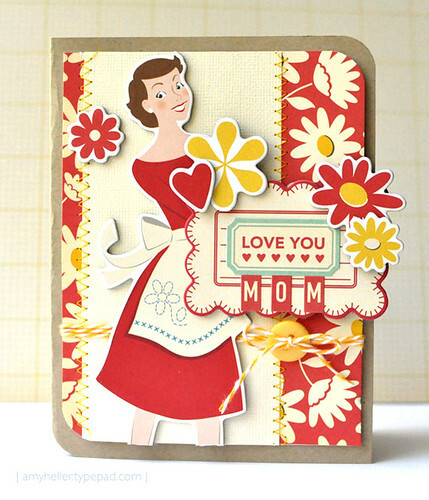 She used 5 & Dime as well as Modern Homemaker for her page and I just love the result. I love how she really emphasized the circle in the sketch by enlarging it to encompass nearly the entire layout. I also love how she stitched the perimeter of her circular patterned paper, really giving movement and texture to her circle. A couple things that Wilna did that I think were really brilliant - she used the main large interior rectangle as her photo and used the two smaller rectangles on the right as her journaling placement, with those adorable tags. It really is beautiful how all the writing and her title are all on the same side of the page - really makes her adorable daughter the focal point of the layout, which it absolutely should. Lastly, I wanted to point out an adorable take by one of our Flickr Gallery participants, Amy Kilgore, and her version of Marcy's sketch from this post. Amy used Campfire to create this adorable layout of her brother and sister fishing in the late 1960's. How FUN is this vintage style photo with Campfire? It's PERFECT and I LOVE it!! Thank you so much, Amy, for taking the time to play along with Marcy's sketch! We love what you did with it!! It is almost that time of year again where we let the special moms in our lives know how much we love them! There's no better way to truly show your love and appreciation than to make something handmade. You are in luck because we have LOTS of great Mother's Day cards to share with you today that will be sure to get you inspired. First off, let's start with a few cards submitted by our fabulous blog readers. We just love when you share what you have been up to! Didn't they do such a great job? 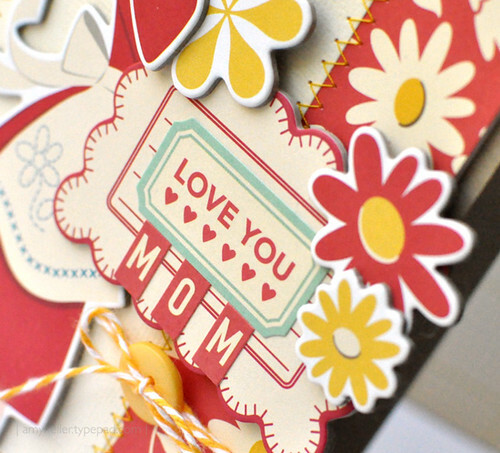 The layering and fun color combinations really make these cards vibrant and exciting. Of course our design team has been busy putting together some amazing cards as well. There isn't a mom around that wouldn't love to receive one of these cards. 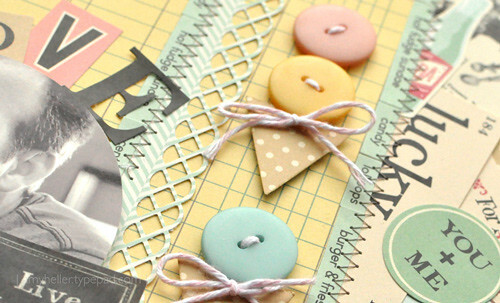 All the little details and embellishments make them fun to make and even more fun to give. Don't forget to take some time in the next few days to put something together for a mom or someone special in your life. They deserve it! Happy Tuesday October Afternoon fans! It's Lexi and I have a video for you today...my first ever video tutorial and it is so NOT perfect--go easy on me ;) In it I introduce the Art Box Sprinklers and show you a fun technique to use your spray inks with! Give it a look and I will see you on the flip side! You can see that after I played around with it more I decided to orient the tag on it's side and flip the rocket shooting up. The patterned paper was trimmed so our paint & ink combined circles could be seen. The sentiment is something my outer space loving 5 year old says, and I quickly realized I would run out of room with using all Mini Market stickers so I typed some of it and punched it out. I tried to photograph the tags I created with the different colors of ink, seeing as if I didn't quite get them on film ;), but as the weather has been terribly rainy and overcast the photo below was the best I can do. I think you can still get the idea though! Thanks for joining me today and like I said in the video,..do link us up in the October Afternoon Flickr gallery if you play with the Sprinklers or any ink circles! We would love to see! Hello, it is Jill here today! Yesterday the kids went on an Easter egg hunt and found all sorts of colorful treasures in the most unexpected places. Why should they have all the fun, though? Now it’s YOUR turn! This week’s challenge is to “hunt” for the following items in your stash, and to fill a layout with as many of them as you can. (1) Your favorite October Afternoon paper. (2) Your favorite October Afternoon alphabets. (3) An October Afternoon tin pin and/or a button. (4) An October Afternoon wild card and/or a playing card. (5) At least one October Afternoon label sticker. (6) An O and an A. (7) A photo of yourself taken within the past month. (8) A piece of paper with your handwriting on it. (9) An excerpt from a poem that you love (since it is National Poetry Month, after all). (11) A list you have made recently. (12) A number that holds some significance for you. (13) Ribbon, thread, string, or cord. (15) A stamped word or image. (16) Ink, paint, or mist. (17) A dictionary definition that describes you or relates to you in some way. (18) A ticket stub or a receipt. (19) A drawing or doodle. (20) A symbol that represents you in some way. (24) Something that brings a smile to your face. While not all of the items are required for the challenge (just as you don’t need to find all of the eggs in order to have fun at an egg hunt), the first ten are must-haves! Feel free to be crafty and combine items on the list. As for me, I set out to tackle all twenty-five items from the list, and had a ball going a-huntin’ through my October Afternoon goodies. Can you spot them all? Here is a peek at some of the hidden elements, including an excerpt from one of my favorite poems, “Susqueh anna,” by Liz Rosenberg, which works perfectly alongside all of the ticking clocks on the layout. Now it’s time for you to get hopping! We would love to see your take on this challenge, so please, share your layouts with us in the October Afternoon Flickr gallery. Who knows, there may just be a prize in it for you too! Happy hunting! 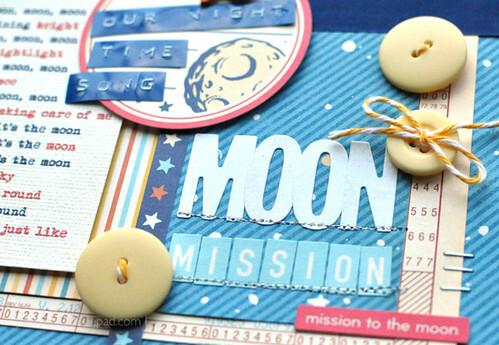 Today we share some projects from Jing-Jing Nickel's deep vault of October Afternoon projects. 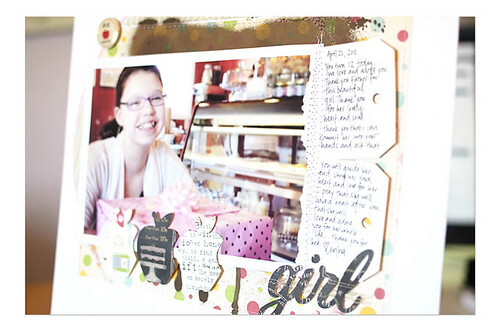 Jing-Jing has been a long time fan of October Afternoon and has made some pretty amazing projects throughout the years! First is a pocket size summer mini-album. Jing-Jing uses the Cherry Hill collection to make this cute little mini. It is simple and effective: some patterned papers on the left and the photo on the right for each page. A few OA sticker elements for the journaling and voila, it's done. On the next layout, Jing-Jing uses the Campfire collection to document a summer trip to Yellowstone National Park. This collection is really perfect for those scenic photos. The giant tree, which is available in the Shape Stickers as well as in the Chip 'N Stick, is the most perfect accent for these photos. Add the adorable owl and fox, and we got ourselves a party in the wild! Lastly, Jing-Jing documents her family's summer garden in this bright and cheerful layout published in the June 2010 issue of Scrapbooking Trends. Notice the similarities in page design between this layout and the Campfire one. According to her, this is a go-to sketch for Jing-Jing. She merges her photos onto a single 4x6 print which gets her two photos for the price of one. Sometimes smaller photos are more flexible and easier to work with than strictly 4x6 prints. Jing-Jing uses a free downloadable program Picasa to merge the photos, no fancy software or complicated steps needed. That's it for today. All of us at October Afternoon hope that you have a wonderful Easter weekend! Hey there, it is Stacey here today! My sketch this week is a variation of my favorite go-to design. I’m a “square” scrapper – I love frames and frames inside of frames and squares piled up on top of each other. Usually, I’ll just add enough “extras” to offset the symmetry and be finished...and then I go make another square layout. It’s a design I go back to again and again because I am just so...comfortable...with it! I think there are at least 12 squares on this layout...I kind of lost track while I was counting and started wondering what was really a square and what wasn’t. The photo collage is made with a group of six photos that I printed out on one sheet. When I create a layout with this type of collage on it, I make sure that I arrange the photos so that I won’t cover any facial features or important details. Since the photos are all similar, I don’t mind covering up some of the background or “white space” with the title or journaling. I had planned on this being a fun, kind of playful layout, but the timing of these photos was tough for me and I could only come up with serious journaling. I ended up needing much more journaling space than I started out planning for, so instead of working a small amount of journaling through one section of the collage around the photos, I devoted an entire block to my thoughts about this particular day. When I do a layout about photos taken this long ago (these are from May 2007), I usually go back and read my blogs from that time period so that I make sure not to miss anything that may have been important at the time. For this layout, I went back to my blogs from April through June of 2007. The main thing going on in my life at that time was my dad’s diagnosis of liver cancer and his death. It’s been a while since I did a “grief” layout, and I wanted to keep this one “real,” so I went ahead and changed the tone a little bit to reflect the reality of those days. I’m happy with how it turned out. To me, it’s not sad, but hopeful. I hope you’ll play with this a little, if you haven’t already – put your title and/or your journaling right on your photos and see what you think. I kind of like the way Corey’s are peeking out from behind the title here...and there’s still plenty of room for the extra fun details! I sent my sketch to my sweet new friend, Lexi Bridges, and she created this adorable layout. It definitely shows how versatile the sketch is! I love how she placed the big title halfway through the group of four photo-booth photos! It’s your turn! We want to see your layouts based on this sketch. Upload your creations to our Flickr gallery here. Hello, it is Jaime here today! I am a layers kind of girl – I naturally use them when I scrap! I love to create clusters of layers and scatter them all over my layout – it’s a great way to use some gorgeous product (like October Afternoon!) and to spread some color and texture. 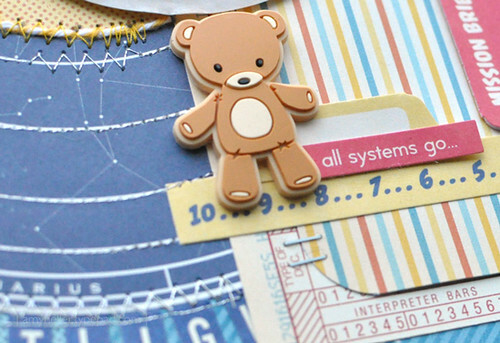 For my tutorial today I will be taking you step by step through building layers on a layout! It’s super easy and lots of fun! When I sit down to create a layout I rarely have a “plan.” I just go with the flow and add things as I see fit or take them away if they just don’t click with what I’m doing. So, if this tutorial seems a little sporadic, I apologize lol!! Step One: I nearly always use 2 sheets layered on top of each other for my background. I cut the top sheet to fit snugly into the center of the bottom sheet. I then distressed the edges and inked them lightly to give them a little pop of color. Step Two: Now it’s time to start building our layers. For this layout I started building first on the right hand side. I cut out one of the flowers from the patterned paper and then cut it in half, attaching it to the far right side. I then layered one of the circles under it. I then cut one of the playing cards in half and attached it over both pieces with pop dots. Step Three: On the far left side I started building my layers on the side and then steadily built them toward the center of the layout. I used the stickers and simply attached them with foam pop dots for extra dimension. Step Four: I then attached my three photos in the center, essentially linking both sides together. Step Five: To help pull the layout together I attached half of a cut out flower to the top right hand side. Then I took one of the flower stickers and cut it in half, placing it under the cut out flower. Again, I used pop dots for extra dimension. Step Six: Now it’s time to really start embellishing! I attached the bubblegum machine with foam pop dots and then started adding embellishments in different areas of the layout, wherever I felt like they were needed. See what I mean about sporadic? Lol! I also splashed on some mist in different areas around the layout. Step Seven: I love adding bits of punched out border pieces to the edges of my layouts – just something to add more texture to the layout. I used a notebook paper punch for this layout and simply attached small sections around the edges. Step Eight: Now it’s time for some bling! To spruce up the bubblegum machine just a little I added tiny little gems to the little bubblegum pieces! It gives it just the right amount of sparkle! Step Nine: Now it’s time for the title! I love October Afternoon’s alpha stickers – the fonts always work perfectly! This layout is all about my oldest daughter getting closer and closer to the age of 11 (How is that possible?!) so my title is simply “how?” I honestly ask that ALL the time these days lol! I hope you enjoyed this little tutorial of mine! See, layering isn’t all that hard – it’s fun! Hi, it’s Becky here, with a Monday morning challenge. As I was thinking about my own albums and the pages that I make, it is very obvious that I have no problem making pages about the little people in my life. I document everyday and special occasions thoroughly for each of our 9 grandchildren. I do find that I don’t document the adults as often, myself included. One thing that I really want my family to remember is the relationship between Tom and I. I don’t often do pages about us. So that is what I focused on with my layout. As I’m thinking ahead, I’d like to do more pages about my parents, my close friends and our adult children. Of course, I won’t be neglecting the little ones either! Isn't Amy's take on the challenge fun? I really like the way she used the lyrics of Sarah McLaughlin song! And she wasn’t afraid to use a pastels in a layout about her man! Love that! Because it really is about telling a story from our perspective, right? My challenge for you is to make a layout about someone you haven’t made a page about in at least 6 months. We would love to see what you come up with, so please post your project on our OA flickr group page here.